We might have begun our visit to Greece in the busy big city of Athens, and joined everyone and their brother on Santorini, but by making Milos our last stop, we made sure that we'd have as much space and solitude as we desired before another year of big city life in Madrid. 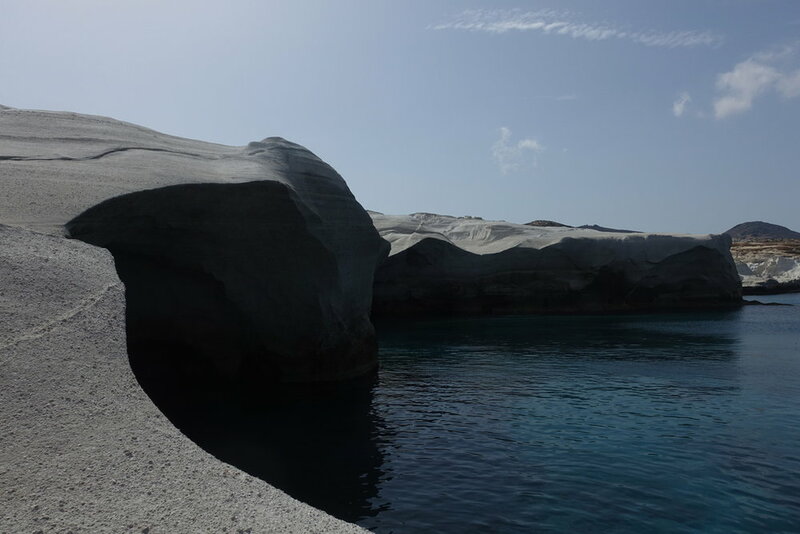 The entire island of Milos has a population of about 5,000 people, and it seems to be gaining traction as a popular tourist destination, recently making lists of best Greek islands to visit (Greece has over 200 that are inhabited, so there's a lot to choose from!). 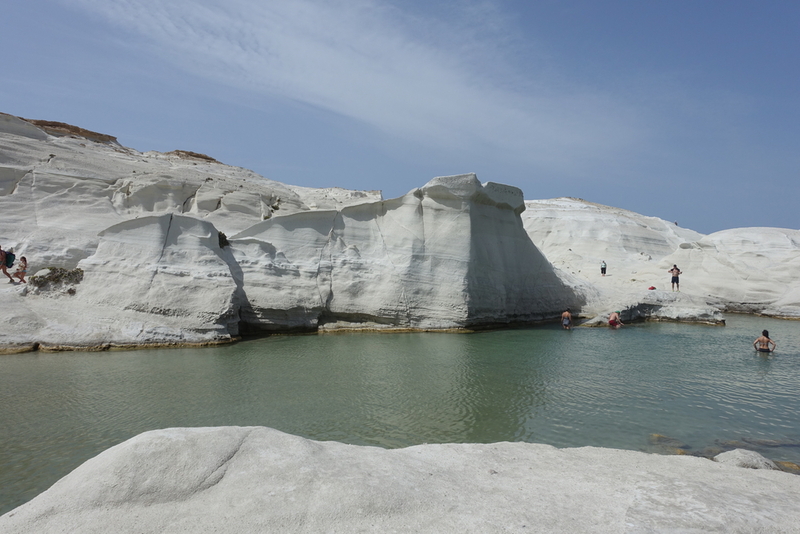 We chose it because of its beaches and because it made sense geographically - we began by visiting Crete, the farthest island we wanted to see first, then Santorini next, and finally Milos which is in between Athens and Santorini. 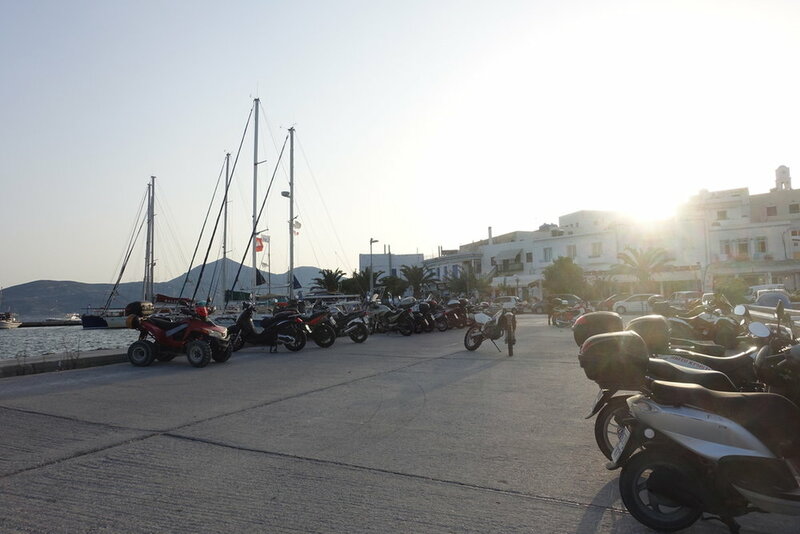 It all came together well, although the ferry between Santorini and Milos certainly wasn't short - six hours was the best option I could find! We staked out a booth that we sometimes had to ourselves and sometimes had to share, but it had an outlet and windows...needless to say, we were happy to get off the boat when the time came! We arrived around lunchtime on our first day, so after checking into our Airbnb, we walked along the quiet harbor and found O! Chamos! Danny and I shared numerous plates - everything was so good and served to us under a roof of greenery as we caught glimpses of the bay across the street. I'd term the restaurant thoughtful - the menu comes in at least five languages, there's a small playground at the front of the patio area for children, and ingredients, such as the goat cheese we enjoyed, are sourced from animals kept on the island by the owner's family. Highly recommend. After lunch we walked across the street to Papikinou Beach for a short, peaceful swim. I think it was mostly us and a handful of locals as Danny practiced handstands and we watched a few boats float by. Our lunch was late and hearty due to not arriving on the island until the early afternoon, so after our swim we walked back through town and called it a day. 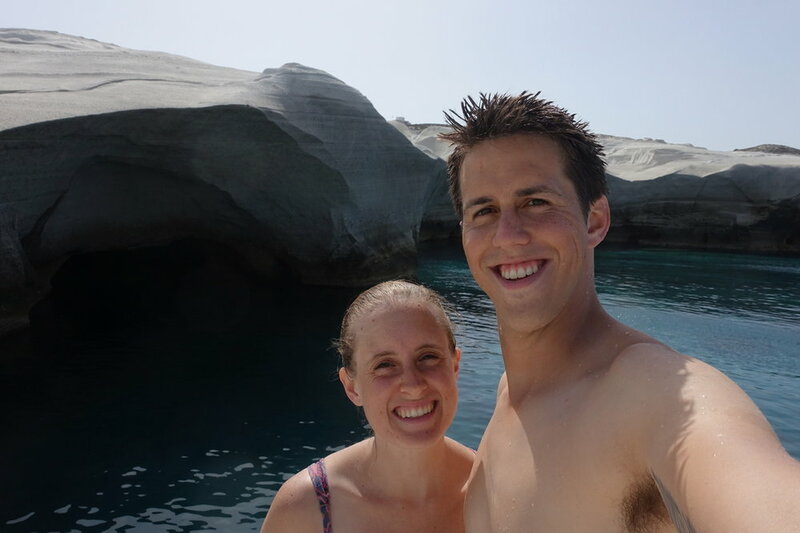 I planned our first two stops in Greece (Athens and Crete), and Danny took the last two (Santorini and Milos). 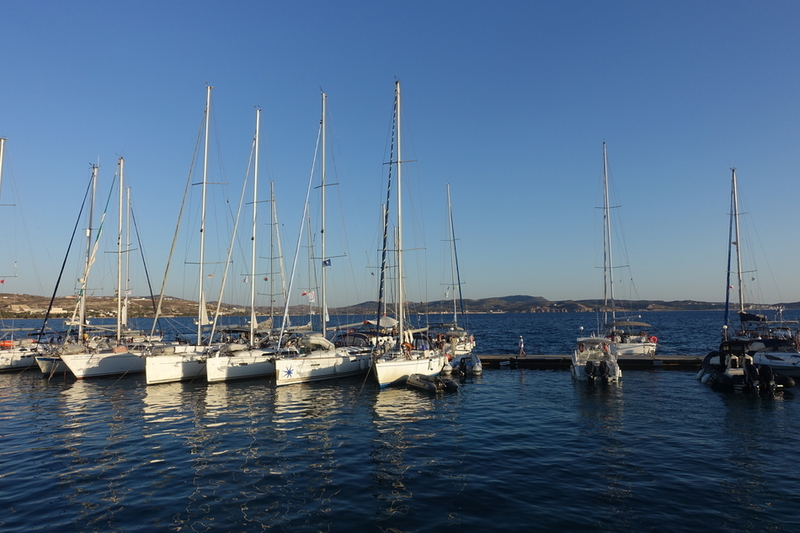 Throughout his planning of Milos, he mentioned taking a day-long boat tour around the island, something I was really skeptical of for a variety of reasons, but he was convinced that it was a good plan so I finally acquiesced. I didn't want to be trapped on a boat for an entire day with people who I didn't know and (I assumed) would just want to party, I didn't want to eat the boat's food for lunch, and, mostly, I didn't want to pay for it. D - This was definitely one of my highlights of our trip. The places we swam were indescribably beautiful (there were enough old people swimming around me to temper my fear of sharks), and we were so diligent about applying and reapplying sunscreen throughout the day that I don't think either of us got sunburned. 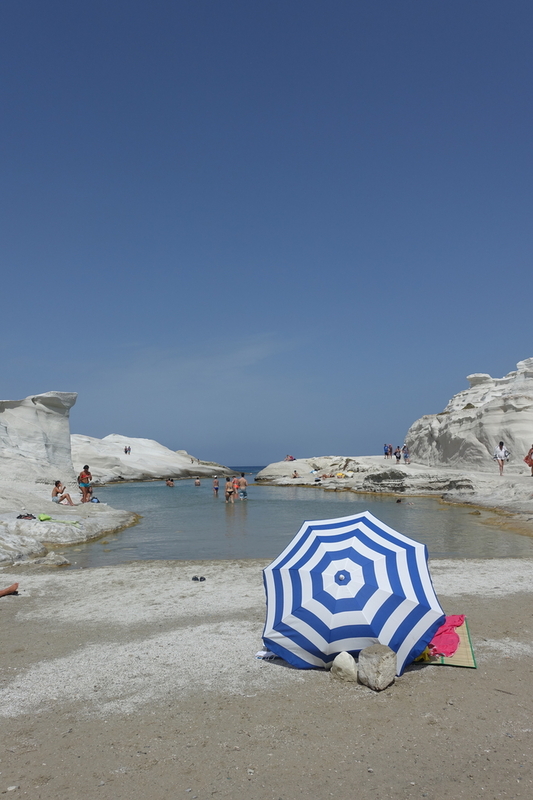 We spent our third day (second full day) exploring different beaches on Milos. After much fear and trembling (on my behalf, I think Danny was pretty stoked), we rented an ATV for our last two days on the island. We decided to begin at the beach on our list closest to us, Firopotamos, you know, just in case - we were both new to this ATV thing. Maybe it was because it was (early) September and the start of the slow(er) season, or maybe it was because it was the morning, but it was us and about three others in the bay lined with houses on one side and rock on the other. The waters were calm and clear, and I don't think it was just because we had the place to ourselves - this seems like a really peaceful place to swim any time you come. 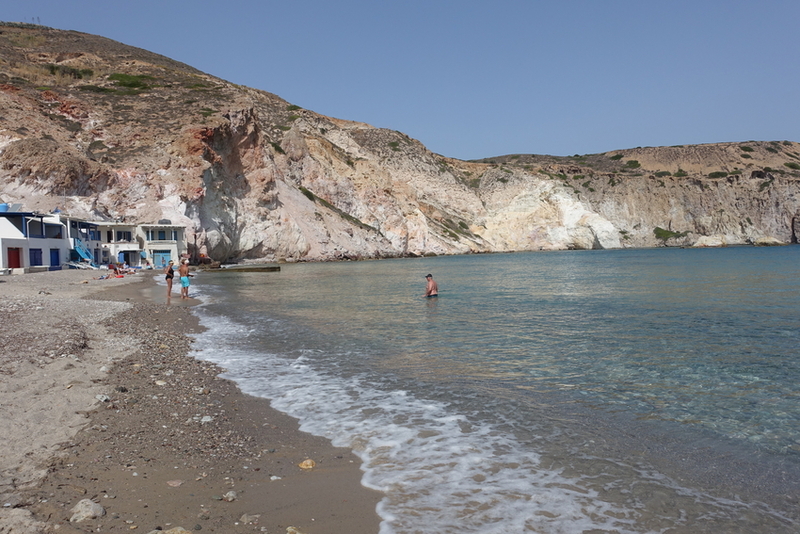 Sarakiniko is probably Milos' most famous beach. There's not much sand, rather, there's white volcanic rock that some liken to a moonscape. We'd gotten a good view of it from our boat tour the day before, but we had to experience it for ourselves. At first we waded into the narrow, very-gradually-increasing-in-depth area of the beach, but found the water stagnant and murky, making it hard to see where we were stepping - meaning we'd sometimes step on sharp rocks as we walked. As we went towards the other side, we found an area where people were jumping into the deep sea, as well as a small cove with access to the sea - the water in this part was a stunningly gorgeous aquamarine color (don't just take my photos as proof - the sun and our camera didn't make a great combo on this day) and we ended up jumping in a couple of times here and swimming around some too. 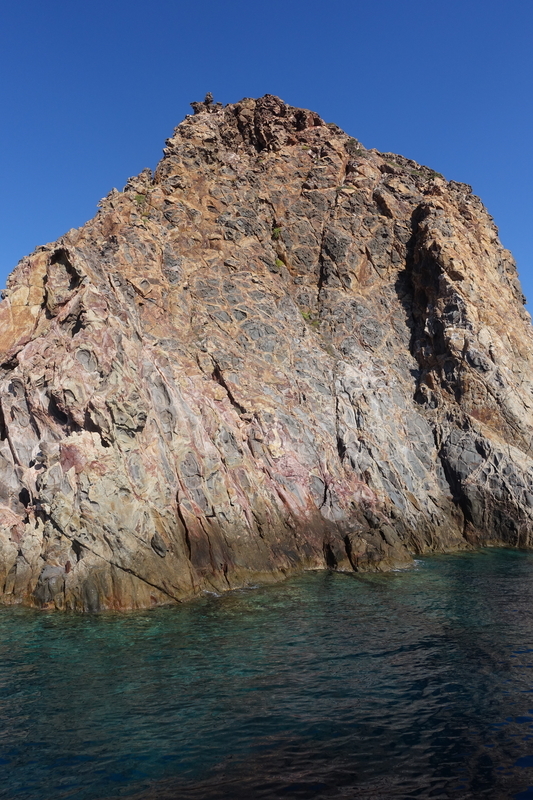 D - Combining two of my fears - heights/cliff jumping and swimming in really deep water - made for a surprisingly rousing good time. The water was gorgeous and so clear that it absolved (almost) all of my fear of jumping off a "high" rock and impaling myself on something underwater. I put the word high in quotations because we could have been jumping from much higher, but we stuck to probably around 10-15 feet. Meanwhile, there was a daredevil there who was running and jumping off of the highest point available and doing perfectly executed swan dives, back-flips, and 900 McTwists galore, garnering him the applause and whistles of several older ladies. "Maybe someday I could be like that," I gently lied to myself. Our final stop of the day was Barriello for dinner, accidentally timed well for sunset. I haven't mentioned it much in my posts about Greece, but the problems that I had encountering cats while eating outside in Turkey definitely continued in Greece, I would say at pretty much every restaurant we ate at, without exception. This was another one of those cases where we started out eating near the edge of the patio, close to the water, until the cat situation got out of hand and we were moved to a higher spot closer to the restaurant that helped matters. D - I have to say, between Shannon yelping/whimpering about a cat under (or in close proximity to) the table and me trying to shoo it away somewhat aggressively in an attempt to have a regular meal, we really created quite a little scene, if you can imagine. Based upon how much we both write about our fears here you might picture us as a couple who prefer to stay locked inside where it's safe and have our food delivered to us through the mail slot, but somehow we manage to lead a pretty normal life. 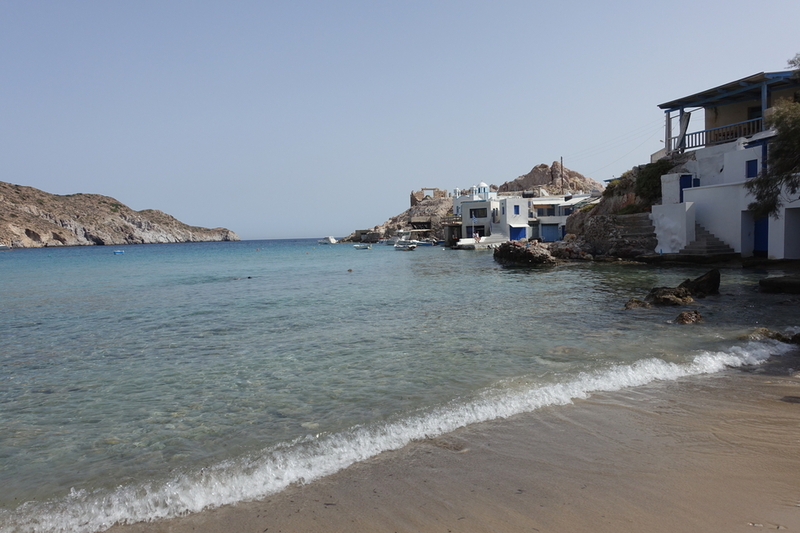 Since we were leaving Milos (and Greece) in the mid-afternoon of our last day, it seemed like a good plan to stay out of the sea since we'd be in a series of planes and airports without a chance to clean up at all for at least 24 hours. We started at another place we'd seen from our boat tour, the fishing village of Klima. The colorful doors and balconies make this a popular place for tourists to stop for photos, as well as, increasingly, for Airbnbs. We had to be careful not to get splashed by the powerful waves that constantly soak the sand and pavement before riding on to the catacombs. The catacombs on Milos were used by early Christians as a burial site, and later on, as a place of worship and underground refuge when persecution stepped up under the Romans. It is considered one of the three most important catacombs in the world, and is possibly even older than those found in Rome. 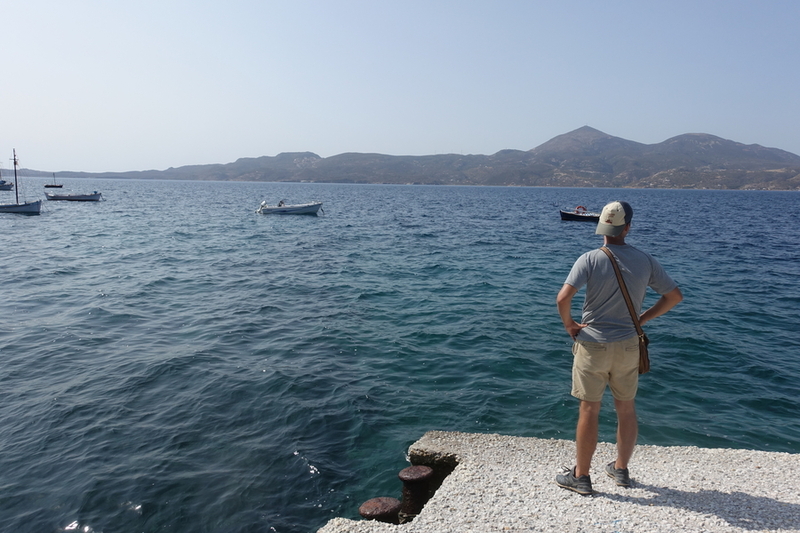 Interestingly, and on a somewhat related note, the apostle Paul may have been shipwrecked on Milos on his way to Crete from Athens. Visits to the site are by guided tour only, and our guide gave ours in English, Greek, Spanish, and Italian - she seemed to be quite accomplished, and able to cater to every nationality on our tour. D - Perhaps I'm just a bit of a philistine, but I found it difficult to be very interested in the catacombs. They all pretty much look the same. I'm sure I just made one of our most faithful readers, Ken Hinton, facepalm, but unfortunately it's true. I prefer swimming over history. Finally, we stopped in the Archaeological Museum of Milos, which is small but, when we visited, absolutely stifling. Using our brochure as a fan, we made a quick circuit through the exhibits before walking through the picture-perfect town it's situated in, Plaka. It was a Sunday, which may have accounted for the ghost-town feel, but we really hardly saw a soul. We took another flight from Athens to Madrid and since we arrived after midnight and didn't have an apartment yet, we opted to stay in the terminal for the night (I mentioned this was a budget trip, right?). Scroll down to see Danny using our travel towel as a blanket and a shirt over his face to keep the light out. I've got a spot next to him on the comfy benches we snagged, but with jeans and my swimsuit cover up for a pillow and the blanket I stole from the plane. A bit of a rugged night, but after all our travels this was our first night camping out in an airport, so we figure it had to happen sometime. And that's Greece, folks! At least, what we saw of it. 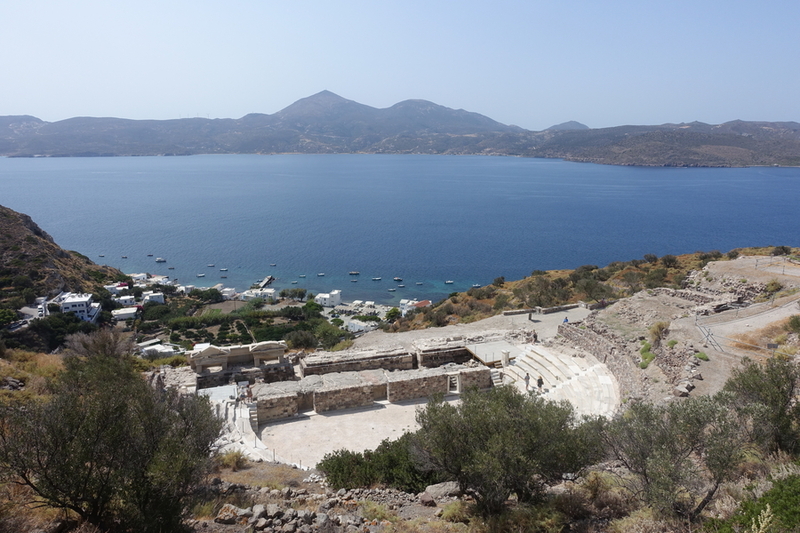 From the ruins of Athens and the beaches of Crete, to the sunsets of Santorini and the adventures of Milos, it was a vacation to remember, that's for certain. Highlights for me, aside from the ones just mentioned, were all of the Greek food, which really and truly was amazing (I can be hard to please, but we ate well, and fairly reasonably, all over Greece), the opportunity to be outside so much as we often spend so much time in cities when we go on trips, and the overall more relaxed nature of the trip. I often pack our itineraries so full when planning, but really tried to lay off a bit on this one, and I think we were really happy with the result.